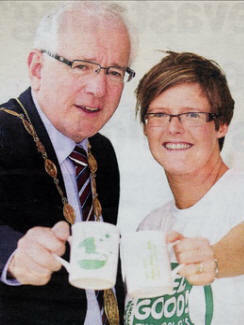 GET your teacups at the ready this September as Lisburn Mayor, Allan Ewart, sticks the kettle on in aid of Macmillan Cancer Support to launch a major drive to get people to help raise over £250,000 for charity. Macmillan Cancer, which strives to improve the lives of people affected by cancer across Northern Ireland, raised a fantastic £154,000 last year by hosting 500 Macmillan coffee mornings. This year the good will charity needs to raise a massive £250,000 to help fund its vital cancer services, from specialist nurses and doctors, to grants and advice for people with cancer who have financial problems. cancer is absolutely essential and we want to be able to give support to everyone who needs it. This year the charity hopes to raise over £8 million from the event, on Friday 25 September, to fund its vital cancer services. "There's no right or wrong way to take part in the World's Biggest Coffee Morning. You can have a traditional coffee morning at home or work, organise a glamorous coffeethemed evening, or even serve up smoothies or herbal tea instead of coffee. The important thing is all the money you raise will help improve the lives of people affected by cancer." To register to host a coffee morning please visit www.macmillan.org.uk/coffee or call 90 708610.